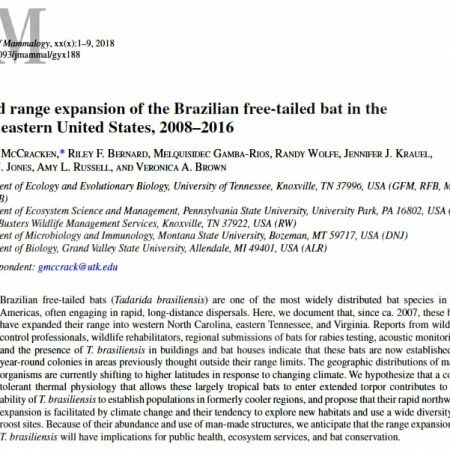 Much of my research has involved the Brazilian free-tailed bat, Tadarida brasiliensis, which is found across the southern US and all the way down into southern South America. 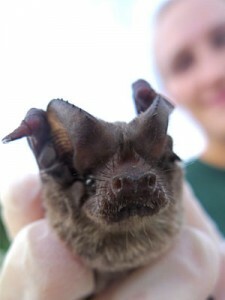 These are the bats you can see streaming out at dusk from caves and under bridges in the US southwest to eat moths. 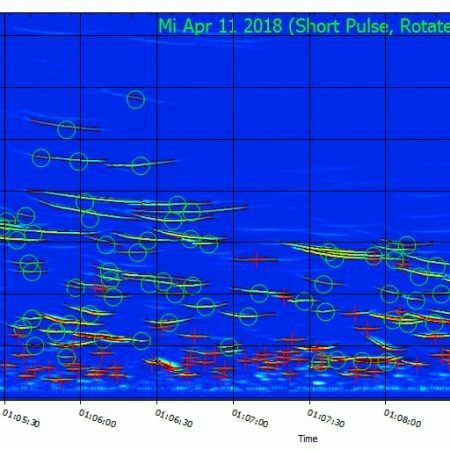 The colony at Bracken Cave in Texas may be the largest aggregation of mammals in the world with many millions of individuals each summer, and it’s even visible on weather radar. 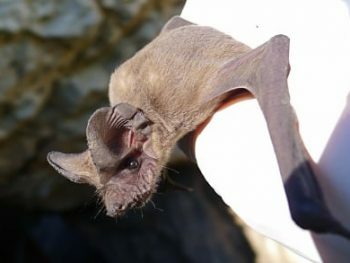 These bats are also famous for their consumption of agricultural pests, preventing damage to crops and saving farmers millions of dollars in reduced pesticide use. They even contribute to the suppression of insect pesticide resistance by consuming insects emerging over fields of GMO crops. 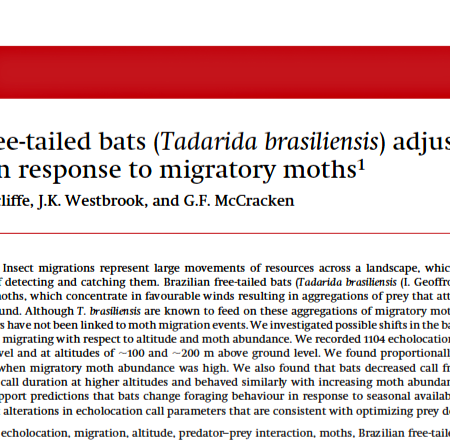 I’m particularly interested in these bats because they fly very fast and very high, making them an ideal candidate for studying high-altitude predator-prey interaction. But there are so many other fascinating things about them! For example, males stake out territory and sing complex songs to attract females. 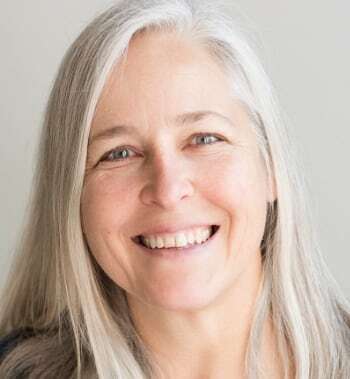 In summer female bats gather in colonial maternity roosts, and when they return from foraging to nurse their pups they find them among masses of 400-500 pups per square foot by recognizing their calls and scent. They’ll happily use bat houses if caves aren’t available. Probably because they live in huge colonies, they are not very aggressive compared to other bat species. Freetails are sweeties! Brazilian or Mexican? You might see these bats referred to as Mexican free-tailed bats elsewhere. They’re the same species! I prefer to use the name Brazilian because that makes it more clear that it’s all one species throughout the new world. We know quite a bit about these bats because they are colonial. Before we learned that it was harmful to the bats, many hundreds of thousands were captured in caves and banded and some of those bands were recovered in remote places. That’s how we know that some of them travel thousands of kilometers during migration. Their migratory behavior is complex. Some individuals migrate long distances, such as the females that move between central Mexico and as far north as Oklahoma. Scientists used to think that freetails migrated along corridors, and they might, but genetic tests don’t support this idea. An increasing number of bats are choosing to over-winter in Texas rather than returning to Mexico, but we don’t know why. Others, such as those in the eastern US are thought not to migrate. Their range in the eastern US is expanding, however, and they are now routinely found in Virginia and Tennessee. 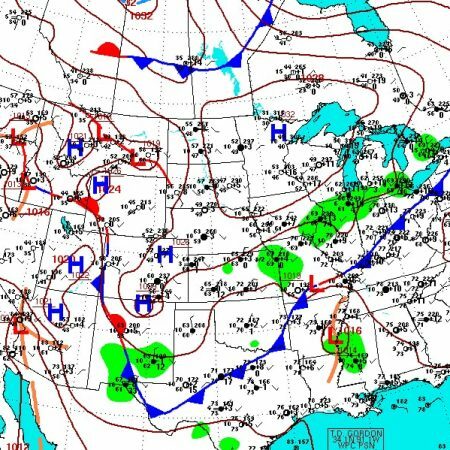 Migration in the US west and elsewhere in their range is very poorly understood. 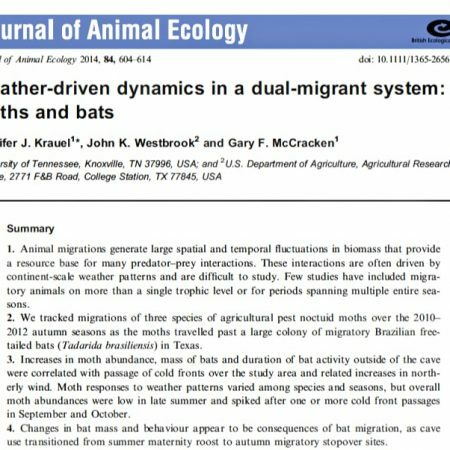 Even though these bats are relatively well-studied compared to most species, we still know very little about how and why they migrate. For the moment, at least, these bats do not appear to be declining. 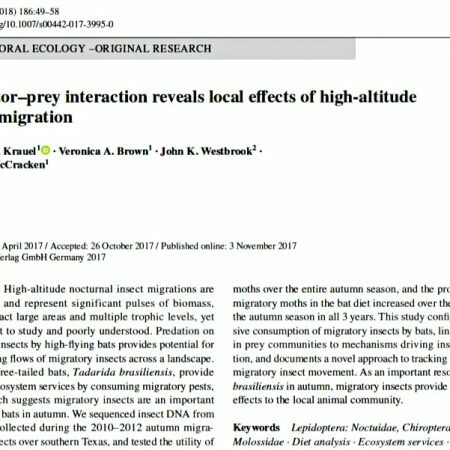 However, as insectivores and consumers of migratory insects, they will be affected by global declines in insect diversity and abundance as well as predicted shifts in wind and temperature due to climate change. 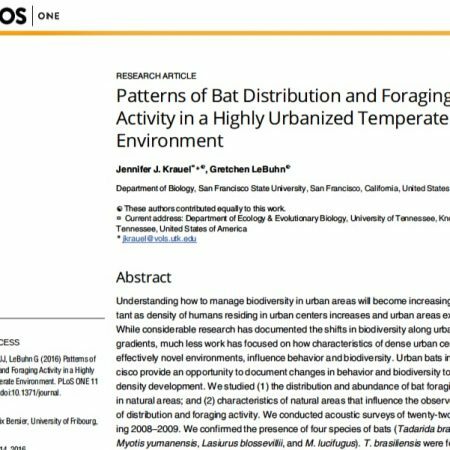 The fungus responsible for WNS has been found in Texas but the impact on free-tailed bat colonies is unknown. Finally, these bats are often killed at wind turbines and the proliferation of wind energy especially around maternity caves is an ongoing threat.